VANES MARTIROSYAN: "I WANT CANELO NEXT"
Junior middleweight sensation Vanes "The Nightmare" Martirosyan (30-0, 19KOs) captured the WBC junior middleweight silver title in spectacular fashion on Saturday night. The Armenian fighter delighted his hometown fans when he defeated the rugged Saul Roman (34-9, 29KOs) via 7th round knockout at the STAPLES Center in Los Angeles. Freddie Roach, who trains Julio Cesar Chavez Jr and co-trains Vanes Martirosyan, said that having the fighters spar together in their respective training camps was a key element in both fighters walking out of the ring with victories. Roach said, "Vanes did a great job getting Chavez Jr. ready for the fight. Vanes is a little faster than Zbik and you could see that the training paid off in Chavez's fight. Chavez also helped Vanes get ready for Roman and you saw that in Vanes' performance. They both worked well together." 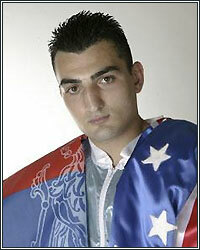 The 154 pound division is loaded with talent which gives Martirosyan many options for future opponents. Saturday night's victory puts the Glendale, CA, based fighter in a mandatory position to face Saul "Canelo" Alvarez. The popular Mexican fighter was on Roach's mind after Martirosyan's impressive victory. When asked who he would like to see Martirosyan face next, the legendary trainer quickly answered, "Canelo." The red headed and freckled Alvarez enjoys rock star status in his native Mexico and is becoming more and more popular in the United States. Canelo has been anointed as Mexico's next big star but Roach is confident that his fighter would beat Alvarez and beat him quickly. "Everybody is talking about how great he (Alvarez) is. I think Vanes would knock him out in one round. Vanes won the eliminator to face him. Lets see how good 'Canelo' really is," Roach stated. Alvarez faces Ryan Rhodes on June 18th. If Alvarez gets past Rhodes, Martirosyan would love to face him in the fall. "I want Canelo next!," exclaimed an excited Martirosyan. "I did my part and won the eliminator for the right to face him. Hopefully he does the honorable thing and fights me next."